Richard Photo Lab is a quality-obsessed company, more interested in doing things the right way than chasing high volume or fat margins. Their passion feeds our work, and their work feeds their passion. They take a great degree of care with their image processing, scanning, and handling - sweating the details of each and every frame - to exceed your expectations. Richard takes pride in personalizing their services, developing unique relationships with their clients, and treating them as the individuals they are. 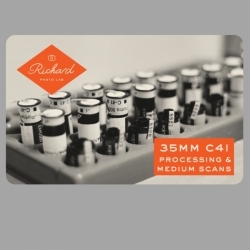 The Richard Photo Lab Prepaid Film Processing Card includes the processing, medium-sized Noritsu scans, digital download, and return shipping of one roll of film. You are responsible for shipping your film to Richard, in your preferred manner. After that, they take over and you just have to wait for your scans to be available and your film to be returned. To redeem, go to www.redeemwithrichard.com, and fill out the online form. DISCLAIMER: You may use this card by presenting it for payment when sending in film to Richard Photo Lab. This is not a credit/debit card and has no implied warranties. Richard Photo Lab is not responsible for lost, stolen or damaged cards. Card is redeemable for purchases only. Card value must be used in its entirety on one purchase. If the full list of services included with the value of this card cannot be completed due to issues with your film, the equivalent value of unfulfilled services will be applied as a credit towards future services at Richard Photo Lab. Beginning January 1st, 2019, card redeemable for services worth original retail value of $30.00. *RETURN SHIPPING FOR ALASKA & HAWAII MAY REQUIRE EXTRA FEES. NO INTERNATIONAL ORDERS WILL BE ACCEPTED.